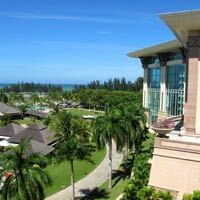 Brunei business hotels review and rainforest guide for hard hats and hard cases. Mosques, tours, business survival tips and one long-nosed monkey. AND HERE in Brunei, deep in the Borneo rainforest, far from civilisation, in a forgotten world of proboscis monkeys and emerald rivers where few men have dared to tread, I stood motionless to marvel at the sight. And there it was again, the beautiful simplicity and graceful symmetry – of a Toyota PRADO Landcruiser. The lady behind the wheel roared past us down an arrow-straight road at something approaching the sound barrier as monkeys shrilled and crickets whirred. Nearby, lost tribes pored over their laptops to update their Facebook accounts. Clearly Negara Brunei Darussalam, the abode of peace, is a jungle escape like no other, a benevolent constitutional Sultanate gorged on petro-dollars where old world and new shuffle on in a somnolent symbiosis, wonderfully out of step with the tumult and jackhammers of Asian development. 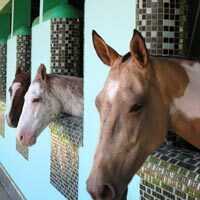 As any Brunei travel guide will point out, it’s a slow, steady pace, a world of purebred polo ponies – a personal passion of the Sultan of Brunei, one of the world's richest men – genteel family distractions and rarely any traffic. Cars wait for pedestrians, palm trees rustle in the heavy, humid air, lightning crackles across purple skies where golden minarets glow as Real Men drink Coke (the country is serenely dry). There is no income tax. Medical services and education are free or heavily subsidised. Why watch Avatar and dream of vicarious utopia? It’s all here. Bandar Seri Begawan is the almost bustling capital where, on Thursday nights, a few cars venture out and queue up patiently for parking spots. No one honks their horns. Places like the Pasar Gadong night market are abuzz with families savouring grilled delicacies for one Brunei dollar (US$1 = B$1.30) as the stalls come alive after 5.30pm. It is worth a visit. I passed through the sizzle and smoke, poking my schnozzle into everything I could find, acquiring a well-cured-idiot-foreigner aroma in the process, a lot stronger than BVLGARI, and considerably cheaper. On Gadong’s main street along the Abdul Razzak Complex of shophouses and dinky restaurants I sauntered past the ubiquitous Bata shoe stores and DVD stalls (B$3 for a movie) to a local halal restaurant featuring mouth-watering local Malaysian fare like spaghetti carbonara and burgers. Nearby Pizza Hut and Kentucky Fried Chicken pulled in weekend punters as did the golden arches of McDonalds (value meal at B$5.95). I opted for a food court in the Jaya Hypermart where I spent the monstrous sum of B$3 for chicken curry and rice followed by morsels at Halal Hong Kong Dimsum. Then, sans alcohol, but certainly tripping, I decided to take the night by the horns and attempt something truly wild. I headed back to my hotel, switched on the TV and tuned into HBO. Truly this is the abode of peace. Welcome to Brunei. 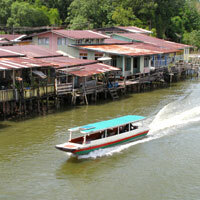 The detailed Brunei Tourism (www.tourismbrunei.com) site is a useful starting guide. On with our Brunei travel guide. Be you a business traveller or a leisure tripper on transit, arrival at Brunei International Airport is pretty painless. It’s a small, simple facility that will disgorge you on the street within minutes. Immigrations staff is polite and smiling, bags pass through an x-ray and then it’s on to a money changer counter and customs. No drugs or guns or rocket-launchers of course and no alcohol unless you’re bringing it in for private consumption, in which case two bottles of wine or spirit are okay. It is a tolerant inclusive Sunni Islam that is practiced here and the government keeps a tight watch on fractious and divisive sentiments. When flying out of Brunei, a small selection of duty-free shopping is available. Save B$12 for your departure tax and then splurge B$158 on a 7.5ml Chanel Coco duty-free perfume, or fork out B$102 for a 50ml BLV eau de parfum from Bulgari. You’ll also spot watches, handbags and souvenir shops. Coffee Bean will brew up a stiff wake-up call with the added lure of free Wi-Fi to accompany your cup of Joe. And Royal Brunei Airlines (www.bruneiair.com) offers free transit tours to its long-haul passengers from England or Australia who have at least five hours to kill. After the sombre inflight video recitations praying for a safe journey, they may well need this respite. Yellow-top white taxis (teksi in local parlance) are lined outside the airport but there is one cardinal caveat – the meters don’t exist or don’t work. You’ll need to employ all your negotiating skills to secure a good bargain. Expect to ride the 15 minutes into town for B$20-$25, or cough up B$40 for the longer run to Jerudong and the Empire Hotel & Country Club. Bear in mind taxis are notoriously difficult to find and flag down in town. Hotels need to radio for cabs but there’s no sense of urgency. If mobility is an issue, head to a car rental counter. Avis (tel: [673-8] 760-642, www.avis.com/car-rental/) and Hertz (tel: [673-8] 726-000, www.hertz.com/rentacar/) are both at the airport. Hertz “economy” models start at around B$80 a day with Avis similarly priced for a 1.5 litre Toyota Soluna. Chauffeured cars would be recommended. The drive into town is quick, green and unhurried. It’s a bit like the stroll in from Singapore’s Changi with all the parkland but no buildings. Lazy roundabouts regulate traffic effortlessly. At the Sheraton Utama hotel it starts getting furiously busy. Here you’ll find one traffic light, a few cars and, amidst the vast empty spaces, a few imposing official buildings like the Royal Regalia Museum. All this calm will confound visitors from Hong Kong who will find few elevator door-close buttons to jab, but it is a soothing reminder of how life might have been before the concrete tsunami overwhelmed Asia. Almost two-thirds of the country’s 400,000 population resides in the capital city of Bandar Seri Begawan with around 20,000 still living in the stilted wooden shacks of Kampong Ayer, the water village on the Brunei River. Majestically rising above the creaking timber and swaying floorboards of this community is the starched white Sultan Omar ’Ali Saifuddien Mosque built in 1958. The midday sun glints off the golden domes and spires while pink-blush sunsets offer ample scope for megapixel captures with picture-postcard reflections in the surrounding lake. Next door is the Yayasan Sultan Hassanal Bolkiah Shopping Complex where you’ll find a few international brands and some local fashion. For more Brunei shopping head to modern establishments like The Mall in Gadong, just 15 minutes from here, to find cinemas, well-stocked food courts, a UNI Arcade Funland, shoe stores, discounted children’s clothes from B$5 up, Giordano, Guess Kids, Body Shop and more. Child-friendly Brunei certainly is. Unfortunately, the 57-hectare US$1 billion Jerudong Park & Playground where Michael Jackson famously performed is practically empty these days and several rides have creaked to a halt. Far better to opt for nature. How often have you seen a Landcruiser up close? You may even spot the Bornean flat-headed frog, a flesh-eating pitcher plant, proboscis monkeys, langurs, gibbons, fruit bats, pythons, or a rare saucer-eyed tarsier. Don’t be fooled by the tiny tarsier’s goo-goo eyes. It’s a raving carnivore. It favours insects though. Water taxis scoot up and down ferrying people and goods. Indeed, this is the best way to see the country, cruising along the ancient arteries of commerce, past Iban longhouses (Labi), mangroves, swamps and blackwater lakes (Tasek Merimbun). Road journeys, straight and comfortable as they may be, are a lot less informative. Given the compact size of the country, most journeys are just a couple of hours at most so it is inexcusable to confine yourself indoors. The landscape and culture is similar to encircling Sarawak, the Eastern Malaysian state while Sabah lies to the east. Borneo, or Kalimantan as the Indonesians term it, is just a two-hour flight from Hong Kong or Singapore. Try rafting, canoeing, walking, climbing and animal spotting. Visit the Ulu Ulu Resort for some soft adventure including a canopy walk strung up high in the rainforest, a hanging bridge, and longboat rides. Perhaps one of the most stunning examples of modern Islamic architecture anywhere is the gleaming and spotless Jamé Asr Hassanil Bolkiah Mosque at Gadong. Intricate geometric inlay work runs through the courtyard with its fountains and fragrant trees and up the main building topped by large golden domes and minarets that spring to life after dusk as the bright up-lights come on. This is a peaceful sanctuary that changes colours and moods with the passage of the sun across the sky, punctuated at intervals by the muezzin’s azan or call to prayer. Brunei is a place you’ll most likely visit for business, unless you’re transiting on Royal Brunei Airlines. A few do come here for dedicated adventure or golf, and others to simply laze, untroubled by hawkers and t-shirt vendors. This is a place to unwind, slowly. If you’re shopping for the best Brunei business hotels, start with the sprawling and very grand beachfront The Empire Hotel & Country Club, a tad out of town in Jerudong (about 30 minutes to downtown), a self-contained oasis of conference and meetings facilities, manicured gardens, more swimming pools than you can shake a stick at, lavish spa facilities – sample Javanese lulur or a mundane nail polish – and a signature 18-hole Jack Nicklaus golf course that runs along the breezy coast. There is a small sanded cove for those wishing to get their feet wet with salt spray but, for those fresh-water inclined, pick from the free-form swimming pools or a 17m indoor spa pool. Burn off calories and adrenalin on three floodlit tennis courts, two squash courts, work out at the gym, try bowling, badminton, snooker or water sports. As a Brunei conference hotels address, this is an all-in-one contender. Apart from its ability to house a large number of guests, there is abundant function space in varying configurations. The 1,650sq m Empire theatre can hold 700 in a theatre-style configuration while the Marine Center can host 100 for a cocktail. This is a large hotel, built on an imperial scale, with a soaring high-ceiling lobby, all slathered in marble, gilt and classic ornamentation, not least of all the million-dollar crystal camel in the lobby. Over-the-top- in parts and curiously restrained in others, this is a hotel built to impress and may not be everyone’s cup of tea. Blazing white marble greets you everywhere and pillars disappear into the heavens. The grande dame is ageing but chipper and friendly. And with grounds of this size, service can sometimes lag. Unlike modern hotels where key cards enable you to access your floors there is no such hurdle here. This is, after all, a place for royals. Deluxe Rooms with a living room and sweeping-vista-balcony are simple and conservatively set up with plump pillows, pale yellow floral carpeting, iron and ironing board, a monstrous (vertical) safe that can house a pony, but no iPod dock and a somewhat discordant boxy Sony TV. There is no DVD player but you can rent one. Broadband is free here while in some other room categories the cabling is still being introduced. These are trifling issues when you walk into the bathroom and sink into the tub with a view. Below you the shimmering pools spread out, touching the ocean horizon. Live like a king, if you’ve got B$400 to fork out per night, or a handy travel agent who can secure a good deal. Despite the imposing grandeur, this is a family friendly hotel so bring the brood. Also in the Jerudong area is the 107-room Holiday Lodge Hotel, far simpler, plainer, with TV and Internet access, some meeting facilities, outdoor pool and children’s pool. The 155-room Orchid Garden Hotel is nearest to the airport – a five minute drive. It is a modern and neat construct rising just a few floors but is happily not a dispiriting tower block. Rooms are ornate, if twee, but comfortable nevertheless. Expect free WiFi, a gym and a spa and the usual smiling Filipino service that seems to characterise most Brunei business hotels. The Orchid Garden is also close to the International Convention Centre (ICC). Next door is the 34-room D’Anggerek Service Apartment that caters for long stay visitors. It calls itself a “boutique” but, save for its diminutive size, that moniker would certainly be a stretch. It is pleasant enough but Internet access can be patchy and slow. Certainly among the top Brunei business hotels close to downtown and just ten minutes from the airport is the long-serving Sheraton Utama. It sports a cheery starched white facade. This is a modest six-floor building with warm, crisp service, boutique touches, welcoming rooms that are smart and functional with all the kit you need, and useful features like a 24-hour business centre, a pool, a spa, complimentary shuttles to shopping malls, and high-speed Internet. In-room, find hypoallergenic pillows, iron and ironing board, data port, and rollaway beds should you have kids in tow. Dive into that now de rigueur Sheraton Sweet Sleeper bed. Expect a children’s pool, babysitting service, and a location that offers a variety of jogging options including hill slopes and a waterfall. There is an Avis car rental counter on the premises. The Sheraton is very much a modern business address in the standard mould. Yet it remains a child-friendly Brunei hotel welcoming of families and scores high marks in this Brunei hotels review. Less than ten minutes away in Gadong is The Rizqun International Hotel, a reflective glass edifice attached at the hip to The Mall, the most happening place in Brunei. The Rizqun’s curving exterior looks over lowrise shops, canals and greenery. 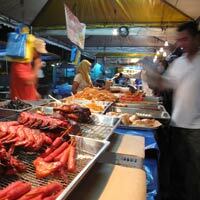 It is a short stroll from here to the Pasar Gadong night market. The hotel’s smoked-glass architecture and overall style is akin to an SUV on steroids, a nouveau muscle hotel with no small measure of brash swagger. But step inside, and it is clear the hotel has heart. Lots of it. The grinning doorman leapt to answer my every question, producing maps, brochures and tips for just about everything. There were the usual Filipino accents at check-in. The interiors of this hotel offer non-stop wall-to-wall and floor-to-ceiling decoration that will be overpowering for some. Greeting the eye are elaborate geometric stone inlay work and faux-European flourishes, carved wooden borders, recessed domes, imitation stained glass, chandeliers, and lift lobbies large enough for an average Hong Kong office. Rooms are enormous with a long writing desk, flat-screen TV, DVD player with speakers, a notebook-size electronic safe, lots of multi-pin sockets and Broadband Internet at B$40 a day (or B$10 an hour). There is an iron and ironing board, a hairdryer, and several large mirrors for narcissist poses. Premier Club floors cater for business travellers. A huge advantage of staying at this hotel is its ready access to the mall (just walk in from any floor), and neighbourhood shops and restaurants, something many of the better local hotels cannot boast. There is a rooftop pool, a small spa, and more than ample conference and meeting facilities. Floors are accessed using an electronic room card-key. Radio taxis are not always easy to come by but this is a brisk Brunei business hotel. Next door is sibling The Centrepoint Hotel, a notch below and less aspirational but no less gleaming, with pool, gym, squash, badminton, business centre, ballroom and meeting facilities. The third in the group is the Abdul Razak Hotel Apartments situated in the downtown area. Do remember though that Bandar Seri Begawan is a tiny place and distances should not be exaggerated. Everything is five to ten minutes away and around B$10-B$20 by cab. Abdul Razak is a long-stay hotel for long-term residents but it rents rooms by the day as well. Expect a kitchenette with crockery, cutlery and kettle, laundry room facilities and satellite TV. For a downtown hotel with an excellent location look at the revamped but not very inspiring Brunei Hotel, with a clean, small lobby, free WiFi and Internet access, function rooms, secretarial service, and in-room facilities including satellite TV, closed-circuit video programming, and room service. 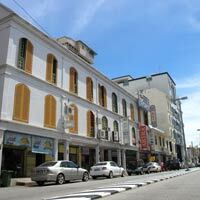 The hotel is right around the corner from the Yayasan shopping mall and the Sultan Omar ’Ali Saifuddien Mosque. You can’t get more central than that. For something purely functional if lacking in finesse, this is a useful address. 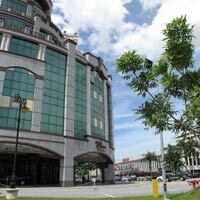 That brings us to the end of our Brunei hotels review at the higher end of the price range. The unpretentious Palm Garden Hotel in Kiulap District offers simple and clean accommodation with a small pool and spa services as well as a sports hall for basketball, badminton and volleyball. 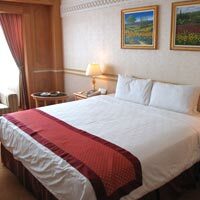 Other cheaper options could include the Riverview Hotel, 10 minutes from both Gadong and downtown, the Brunei budget hotel Traders Inn with 84 rooms that will set you back just around US$45, the two-star Grand City Hotel closer to the airport, or Nazira Guest House near Jerudong. That's the long and short of our Brunei travel guide and hotels review. If you can find a taxi head out for a sumptuous dinner. Later, you can go really wild and tune into HBO. Just don’t tell anyone. Airlines: A number of airlines serve Bandar Seri Begawan. Royal Brunei (www.bruneiair.com) is the national carrier. On its regional B767 aircraft expect a 2-3-2 configuration in economy while the smaller Airbus A319 is set up in 3-3 with Row 26 heading the economy cabin. The B767s offer reasonably roomy economy seats in marbled grey with yellow cushions contrasting with burgundy uniforms. There is a PTV operated by a remote control. The A319 has no PTV but a simple drop-down overhead screen. Other regional airlines include Dragonair (www.dragonair.com), THAI Airways (www.thaiair.com), Singapore Airlines (www.singaporeair.com) and Malaysia Airlines (www.malaysiaairlines.com). Taxes: Many hotels do not levy any government tax or service charge. This is true of the Rizqun International and its two sister properties Centrepoint and Abdul Razak Apartments, a Brunei long stay hotel. Others like Empire Hotel & Country Club add 10 percent to the bill. Do check on this. Travel agents: You may wish to book through a travel company like Sunshine Borneo Tours (www.exploreborneo.com). 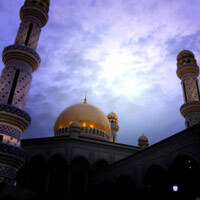 Useful websites: The detailed Brunei Tourism (www.tourismbrunei.com) site is a useful starting guide. Exchange rate: The currency conversion from US dollars to the Brunei dollar is US$1 = B$1.30. Abdul Razak Apartments. Tel:  224-1536, fax: 224-2301, (e-mail: dm@abdulrazakhotelapts.com or www.abdulrazakhotelapts.com). 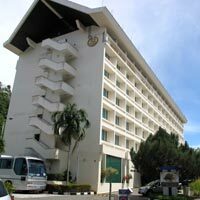 Brunei Hotel. Tel:  224-2372, fax: 222-6196, (e-mail: bruhot@brunet.bn or www.bruneihotel.com.bn). Orchid Garden Hotel. Tel:  233-5544, fax: 233-5444, (e-mail: ogh@brunet.bn or www.orchidgardenbrunei.com). Palm Garden Hotel. Tel:  223-3448, fax: 223-4448, (e-mail: palmgarden@brunet.bn or www.palmgarden-hotel.com). Sheraton Utama Brunei Darussalam. Tel:  224-4272, fax: 222-1579, (e-mail: reservation.brunei@sheraton.com or www.starwoodhotels.com). The Centrepoint Hotel. Tel:  243-0430, fax: 243-0200, (e-mail: info@thecentrepointhotel.com or www.thecentrepointhotel.com). The Empire Hotel & Country Club. Tel:  241-8888, fax: 241-8999, (e-mail: sales@theempirehotel.com or www.theempirehotel.com). The Holiday Lodge Hotel. Tel:  261-1618, fax: 261-1619, (e-mail: sales@theholidaylodge.com or www.theholidaylodge.com). The Rizqun International Hotel. Tel:  242-3000, fax: 242-8000, (e-mail: info@rizquninternational.com or www.rizquninternational.com). Ulu Ulu Resort. Tel:  244-1791, fax: 244-1790, (e-mail: sales@uluuluresort.com or www.uluuluresort.com). D'Anggerek Service Apartments . Tel:  234-5222, fax: 234-5333, (e-mail: inquiry@danggerek.com or www.danggerek.com). Grand City Hotel. Tel:  245-2188. Nazira Guesthouse Hotel. Tel:  261-2053.